I thought I might try the new Jamie Oliver restaurant in town last night, but there was a triple layer queue to get in and my rumbling stomach was having none of that. Also, having eaten a lot of fish and veg this week, I was in a dire need of a meat fix. For the life of me I could not think of any good places for steak and didn't want anything too formal, so we stumbled past the bustling El Mexicano in New Road and it seemed a good idea. Last time I went here was a good few years ago and I remembered the food was quite good. Spicy steak sizzling on a skillet? Oh yes, count me in. Mr Graphic Foodie being a nacho obsessed simpleton always has to have them as a starter. They arrived with a sprinkling of cheese and some insipid salsa that tasted like it was from a jar. You had to order the guacamole and sour cream separately apparently which is like serving spaghetti and charging extra for the sauce. In any case they were cinema nacho standard at best. I went for the sopes as I saw a picture of some in the week and they looked generous, rich and delicious. 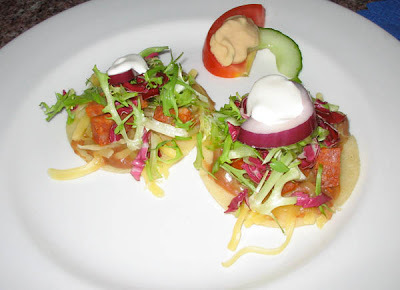 What arrived was two little pathetic tasteless corn discs topped with some half arsed salad and chorizo cubes. And what the fajita is that cucumber, tomato and unidentifed cream blob doing there? What is is doing? If I were in power, the first law I would put into practice is forbidding pointless garnishing. I was almost dreading the main meals coming by now. I ordered the Gorditas de Res, shredded beef brisket parcels covered in a thin batter, served in a spicy tomato sauce with rice, refried beans and another freaking 80s salad garnish with thick vinegarette. Mr GF ordered the beef enchipotlada which was drowned in the same tomato sauce. Both were perfectly palletable and the brisket was very tender. My dish had a good level of heat but there was no real taste spark and the watery separation of the tomato sauce suggested a reheat. Two mouthfuls in and I was bored. Looking at both our dishes and at the other tables, what was becoming apparent was that this is the sort of Mexican restaurant where there are a core set of sauces and ingredients that are just presented differently or the tortillas folded another way to form all of the items on the menu. You know the type. 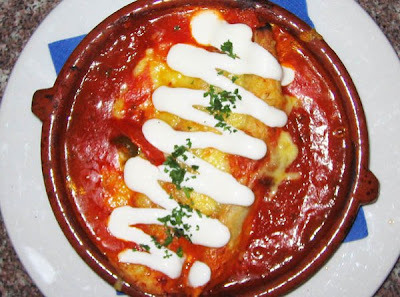 The same tomato sauces, the same beige refried beans and salad garnish on everything. I don't think any of the dishes have been individually considered. They must just make vats of these basics and reheat them to serve. Lazy little wotsits. 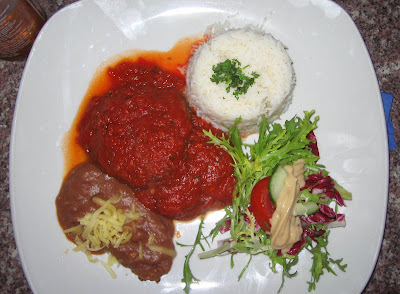 I always paruse the desert menu before ordering mains and really had my eye on the chick pea cake with orange but didn't want to take the risk of it turning up with that tomato sauce or that salad garnish. This restaurant makes it's money in it's prime location in the theatre district and the passing trade. The rough and ready atmosphere is fantastic if you want something informal and cosy and I must say the staff were great but they really need to pull their socks up on the food which is not terrible, but overpriced for the mediocre dishes they offer. Had it been cheaper and had pictures on the menu then fine, because you would have know it was that sort of place. On review sites elsewhere there seems to be a love it or hate it mentality and a few do rate this restaurant quite highly. But would I personally recommend El Mexicano or go back here? 'El no.